Hopefully this will help you out and you enjoy it! To see the full tutorial showing you how I apply all of my face products, head to my Instagram account here and see everyday makeup tutorial in my IGTV or on my youtube video here! Step 1: after priming my eyelids with concealer, I take my morphe m504 brush and dab back and forth between these two shades here. Then I place all over my lid and up into my crease. I am pretty sloppy with it. step 2: taking my morphe mb23 brush I go into this deep brown shade in the upper right corner and put that just in my crease, right below my brown bone. I do windshield wiper motions- and I do this just to deepen the crease a bit and add more dimension. Step 3: taking my ring finger, I go into the shade lucsious (second to the end on the top left corner) and place that all over my lid. step 4: go into the black shade with your flat brush and smudge this along the upper lash line. I am realllllly not precise with this. this is just to darken my lash line to make my lashes look more full. step 5: going back into the dark brown shade, I use this to smudge under my lower lash line. 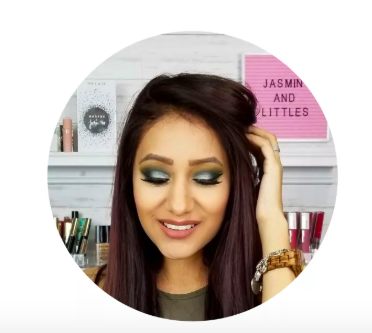 Check out jasmines blog and her instagram here! She’s sooooo talented, and she’s a beautiful person in and out! So I think you’ll just love her! :) Happy thursday!! Check out her insta here!